Irish Dessert Recipes: 12 Delicious Treats From Irish Ingredients! Irish Dessert Recipes: Delicious Dishes to Tempt Your Irish Sweet Tooth! For a tasty way to express your Irish side, try serving Irish dessert recipes at your next St Patrick's Day party (or any gathering for that matter)! Here we will share three special desserts that have gotten glowing reviews from our own family and friends. And if this page leaves you wanting more, we have many other tasty Irish recipes to explore here. Meanwhile, read on and enjoy our favorite Irish dessert recipes! This dessert is a delicious example of Irish culinary creativity, combining potatoes, eggs, Irish whiskey and heavy whipped cream. 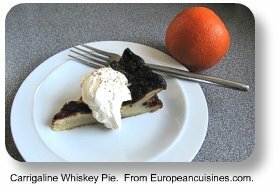 We've made Carrigaline Whiskey Pie, to rave reviews! It's a delightful, surprisingly rich Irish dessert recipe that hearkens back to traditional life in the countryside. 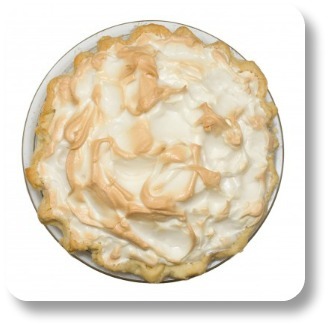 Click here for our delicious Carrigaline Whiskey Pie recipe! Apple scones reflect traditional Irish thriftiness, but they also satisfy the typical Irish sweet tooth! This dessert embodies the best of Ireland because it doesn’t use any expensive imported fruit as ingredients – just the simple apple, one of the few fruits that grows well in the Irish climate. Unlike other types of scones, the entire mixture is baked “in one piece” and then cut into sections after you remove it from the oven and sprinkle it with sugar. 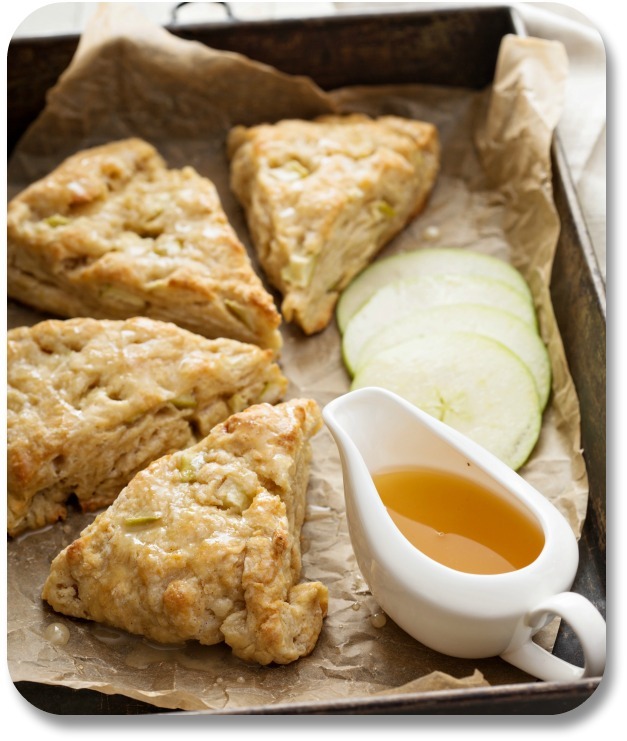 Click here for our delicious Irish apple scones recipe! This is another Irish dessert made with apples, and it has long been a favorite. Almost every Irish farm boasts at least a few apple trees. And according to the laws of the time, anyone who damaged someone else’s apple tree was required to compensate the tree’s owner by transferring ownership of several cows. Here’s a recipe for Apple Amber which has always worked well for us! There are many kinds of Irish cookie recipes, more than we could possibly include here. The question is: how do you choose the most authentic and easy to prepare (and delicious) option? 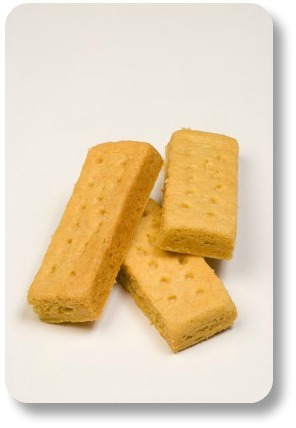 In our opinion, the cookie that most closely fits this definition is... (drum roll please) the humble Irish shortbread cookie. Visit our Irish Cookie page for more details and instructions! Irish cream bundt cake qualifies as an Irish expression due to its secret (ok maybe not so secret) ingredient... Wait for it... Irish cream! True Irish cream is made with Irish whiskey. This spirit is very much a part of the recent history of Ireland and therefore, any recipes including Irish cream instantly become Irish expressions. Plus they usually taste terrific! 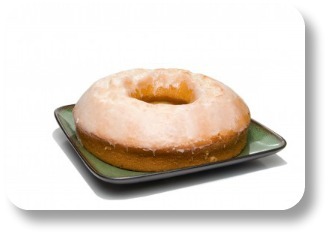 Interested in seeing the recipe for Irish Cream Bundt Cake? Here it is! Nothing says Ireland quite like Baileys Irish Cream, the delicious beverage that comprises 50% of the spirits exported from the Emerald Isle. Sooooo – what better way to get your Irish mojo working than throwing a bang-on party, filled with two of Earth’s most delicious flavors? Curious? Check it out here! We've been told this Irish dessert recipe has no historical roots in Ireland. But it's so delicious we don't really care! The recipe below contains lovely Irish flavors. Think of it as an Irish twist on a classic dessert. And as with many authentic Irish meals, it is made of simple ingredients and is simple to make. Your taste buds will thank you for it! Potato candy is one of our favorite Irish dessert recipes, and we're always surprised that this treat isn't better known! These sweet goodies may or may not even have Irish origins but they're still a favorite snack on St. Patrick's Day and other Irish occasions. As with many dessert recipes, there are several different versions of potato candy - one type even contains potatoes! 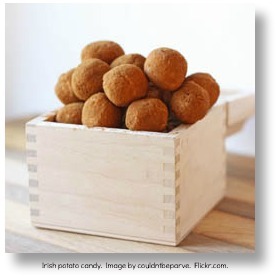 For more information on this recipe that really 'should be' Irish, visit our Irish Potato Candy page here! If you are looking for a classic Irish dessert recipe, this one should fit the bill. It is simple, hearty, and can be made several ways, all of which yield the same delicious flavor of baked apples. 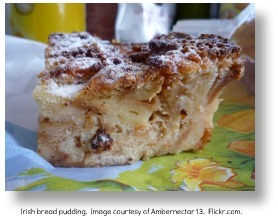 Irish Apple Cake is a dish made from flour, butter, sugar, apples, eggs, and spices. It can be made several ways, with the simplest called “Kerry”Apple Cake. The majority of versions of this cake call for a tart apple. Granny Smith, or the traditional Irish Baking apple, both are delightful in it, although any apple that suits personal fancy can work. 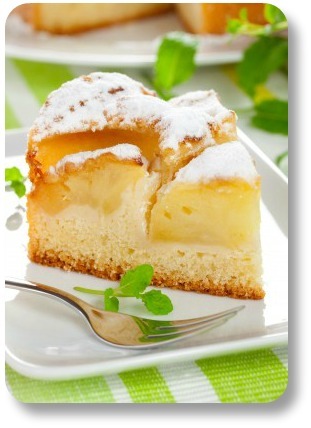 Click here for our delicious Irish Apple Cake recipe! The uniquely Irish flavor in Irish cream cheesecake is - you guessed it! - Bailey's Irish cream. While there are many variations to this dessert, the core recipe is simple and easy to make at home. 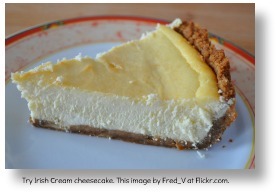 Click on the following link for is our family's favorite Irish cream cheesecake recipe! When we first tried Irish whiskey cake we were doubtful. Would the flavors 'work' together? Could you taste the whiskey? Judge for yourself! Find our favorite Irish Whiskey Cake recipe here! It’s not too sweet, so it tricks you into eating more. It has the tang of everyone’s favorite Irish beer. 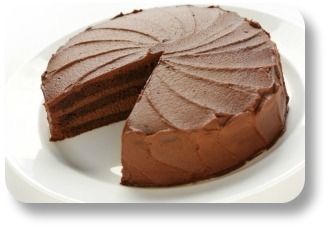 Check out our Guinness Chocolate Cake recipe here! The come back and tell us what you thought of it! This section of Irish Expressions grows on a daily basis, and there are far too many recipes to show all on one page. 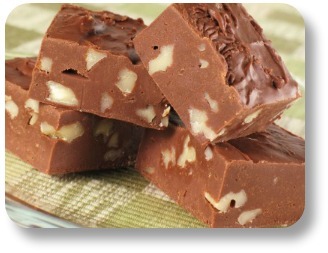 For more information on Irish dessert recipes, check out our page on St Patricks Day Desserts. 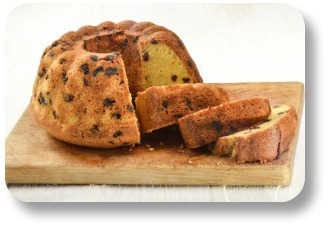 And for dessert recipes with a specific purpose, have a look at Irish wedding cake, and Irish Christmas Pudding! Ok, I'm Starving! What's Next? Until then - thanks for visiting our favorite Irish dessert recipes! Please continue exploring your Irish side at Irish-Expressions.com.